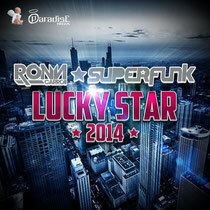 After a hit record in 2000 with ‘Lucky Star’, the French DJs from Superfunk and Chicago-based singer and DJ, Ron Carroll, are back with a new twist of the track – ‘Lucky Star 2013’, out on Paradise Records. With the original version being a worldwide hit with top sales in France, Germany, Switzerland and Belgium, this new version is aiming for the same success. Known for his vocal performance on ‘Lucky Star’, Ron Carroll, also known as R.O.N.N., is a highly respected American DJ, singer and producer and has played with the likes of Frankie Knuckles, David Morales, Lil Louis and Ron Hardy. French house band Superfunk formed in 1998 and is composed of Stephane B & Mike 303. Known for their dance tracks, Superfunk have played alongside Bob Sinclar, Felix Da Housecat, Gus Gus or Neneh Cherry! Check it out below.